Article first published as Interview: Marsha Samoylenko Denison, Author of ‘Grisha’s Loop: My Slavic Saga’ on Blogcritics. Marsha Denison was born in Boston, Massachusetts, and grew up in the nearby suburb of Newton. She attended the University of Massachusetts in Amherst, and later received her Master’s Degree in Gerontology at St. Joseph’s College in West Hartford, Connecticut. She has two daughters and three grandchildren, and since her retirement from health care in Connecticut, she and her husband retired to their beach home in Ocean Park, Maine. Although she has written other published articles, this is her first book; an attempt to record, share, and encourage others to cherish the written word and memories of years gone by. Sheri: Welcome Marsha, and thank you for being here today! Why don’t you start by telling our readers a bit about Grisha’s Loop? Marsha: It’s a story of courage and survival. 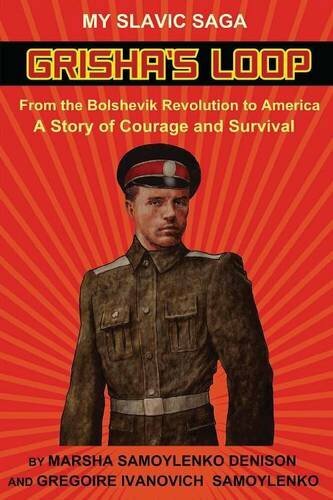 The book chronicles the life of Gregoire Ivanovich Samoylenko (endearingly called Grisha), and shares his journey as a little boy growing into a young man through his participation in the Russian Revolution as a member of the Tsar’s army. As he fulfills his duty to his country, he abandons his plans to continue his education at Petrograd University to pursue a peripatetic journey through Russia and around the Black Sea. Love, loss, intrigue, and threats to life and limb beset Gregory’s path, until he finally lands on American soil, where he marries and raises a family. His haunting nightmares compel him to resurrect the past and set his thoughts to paper, thereby cleansing his mind of terrifying memories. The result is his written manuscript “My Slavic Saga,” rendered in his own poignant, flowery language – unfinished and beautifully raw. Marsha: My then fourteen-year-old grandson needed to write a school paper about ancestry. He chose my Russian born father as his subject, and turned to my husband, his grandfather, for information about Gregoire Ivanovich Samoylenko, who had survived the Russian Revolution. My husband and father had a close relationship, and my father had, at one point opened up, and shared some of his stories about his life in Russia. My husband wrote a letter to my grandson, and after I read it, I decided perhaps it was my time to go through my father’s papers, pictures, and writings to see what I might further discover. The old “forgotten box” that I had kept in my possession for many years took on a life of its own, coaxing me to delve into its contents to write and record my father’s story. Above all, I wanted to organize and preserve my father’s ancestry for my children, and all other family members to come. Sheri: What was your biggest challenge in writing Grisha’s Loop? Marsha: There were many challenges, not the least of which was my advanced age and lack of knowledge as to how to write a book, or navigate the current technological tools, my father’s life in Russia, working in the world of computers, setting up and learning Facebook, etc. Another huge challenge was to find someone willing and able to translate my father’s Russian documents of the 1900s into English, so I could record and piece together the many missing parts of his life and journeys; then, finding the right self-publisher to help me create the finished product. First and foremost, I wanted to preserve my father’s documents and original manuscript for my family. Those who read the manuscript thought it should be published to share his story with the public. Sheri: How did you piece together the story from your father’s notes? What can you tell us about the research and work that went into putting the story together? Marsha: This book has truly been a “joint effort” with many others sharing their time and knowledge to enable this unique story to become a shared reality. In actuality, it is a book within a book. My personal experiences and observations bookend my father’s amazing story, written by him in beautiful prose and his second language. I also researched the historical and political times of Russia during the period of my father’s life. While doing that I realized that I needed to keep this to a minimum, as there was such a vast body of knowledge to learn and share. Sheri: Did your father share stories with you about his life in Russia? Marsha: My father was a very private man and was reticent about sharing his past. I now realize that when he told us bedtime stories, he sometimes referenced some of his childhood memories. It was not unusual for those who immigrated to the United States in those years to try to assimilate into the American culture as quickly as possible. Therefore, many memories were not shared, and in my father’s case, he suffered with horrific nightmares, thus writing My Slavic Saga as a means of perhaps dispelling his demons. Sheri: What is it you hope readers take away from Grisha’s Loop? Marsha: In this era of huge technological advances, we are losing the historical pieces passed on to us through diaries, love letters, journals, actual pictures, etc. As a gerontologist I have been keenly aware of the importance of these physical memories jotted down to lead us into the past, thus helping us to also understand the future. These are cherished documents and should not be thrown away lightly. Sheri: What kind of response to your writing have you had from readers thus far? Is the past prologue? 100 years after the Russian Revolution in 1917, are we now on the brink of great change in Russia and the world in 2017? Marsha: Three things: keep on trying, this too shall pass, and never lose your sense of humor. Sheri: Do you have any advice for aspiring authors of memoir and biography? Marsha: Immerse yourself in the times and personalities. Marsha: I like to golf, kayak, bike ride, walk, and be with family and friends. I am blessed to be close to the ocean where I can walk and explore each day. Sheri: So, what’s next? It sounds like there is more to this story – is there a sequel in the works? Marsha: Yes, indeed, there is more to this story and I feel strongly that is would be a good movie. If I were to write a sequel, I would focus on the historical periods and what was going on in Russia at each point in my father’s life, intertwining it along with his journey. Unfortunately, I don’t know anyone in the film industry, or how to go about getting someone to convert this into a film script. I would also like to find somewhere where I could donate all these precious old Russian documents. It would be a shame to have them thrown out. Sheri: Do you have a website where readers can learn more about you and Grisha’s Loop? Marsha: Yes, I’m on Facebook under Marsha Samoylenko Denison at https://www.facebook.com/Marsha-Samoylenko-Denison-101642450326171. Sheri: Where can readers purchase Grisha’s Loop? Marsha: It’s available on Amazon and Barnes & Noble, as well as Outskirts Press. Sheri: Marsha, thank you so much for your time today! I really enjoyed getting to know more about you and your father’s story: Grisha’s Loop and I wish you the best of luck in your future endeavors!